French artist Françoise Gilot, born in 1921, can look back on a long history. As a painter of the Nouvelle École de Paris after the war, her work hovers between abstraction and figuration, drawing as much on nature and everyday life as on moods and imagination. 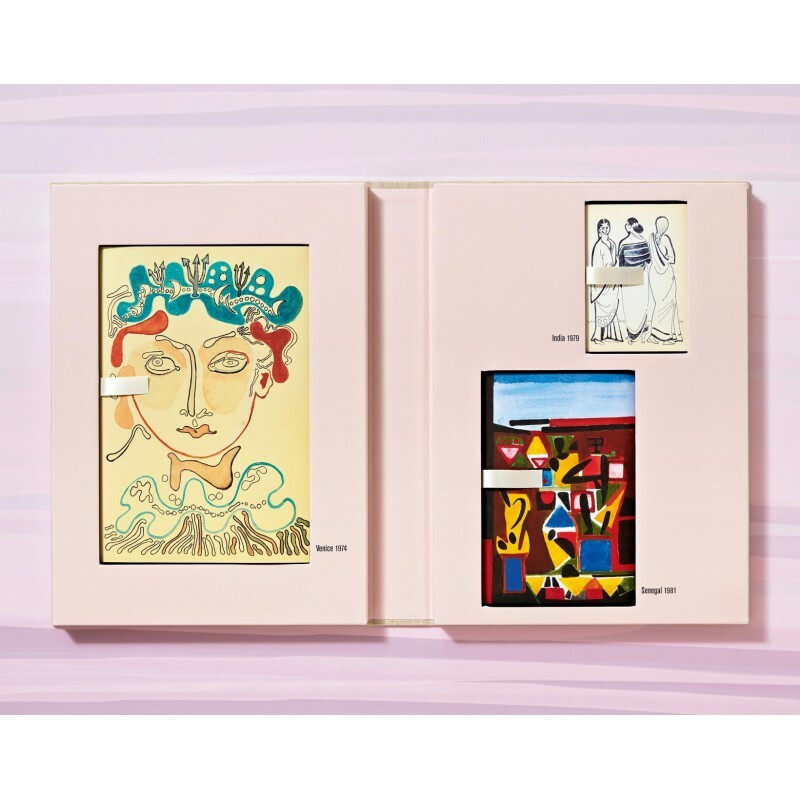 She has published a number of books, not just her famous Life with Picasso, in which she recounts her experiences of 10 years at the side of the most famous artist of the 20th century, but also poetry and stories with her own illustrations. 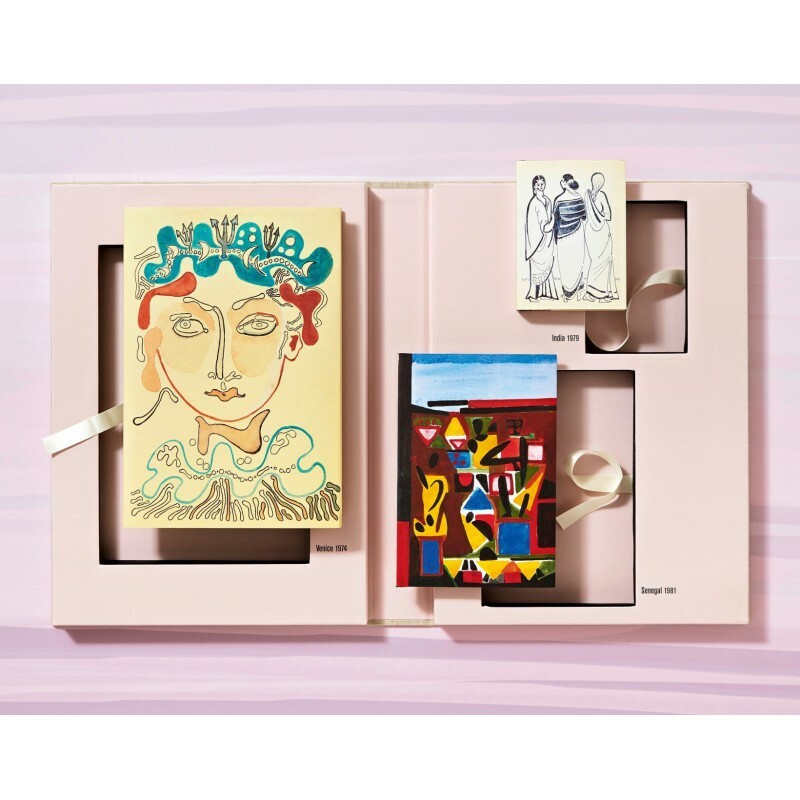 This fold-out box set presents a hardback facsimile edition of three sketchbooks made on Gilot’s travels between 1974 and 1981. Collecting direct impressions and abstract reflections, they are suffused with the distinct atmosphere of these places: Venice, India, and Senegal. 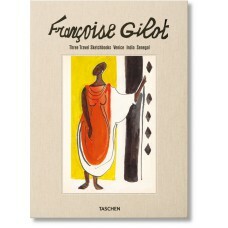 Gilot travels to Venice in the summer of 1974. Her regular visits to the floating city as a child have made a lasting impression, and she feels a deep, continued connection. Her sketchbook drawings are made with a subtle palette, centered on different shades of a watery blue. Views of the city are mixed with reimaginations of the canals and cityscape, yet it is above all the spirit, history, and myth of Venice that animates her work. She also pays tribute to its art with various pages characterizing her forebears: the Bellinis, Carpaccio, Giorgione, Veronese, Titian, Tintoretto. Gilot mixes writing with the illustrations, her beautifully organic lettering becoming part of the drawings in which she depicts the canals, the cafés, the lovers at the water’s edge. In 1981 Gilot visits Senegal, together with her husband, Dr. Jonas Salk, inventor of the polio vaccine and at the time in Africa for a vaccination campaign. 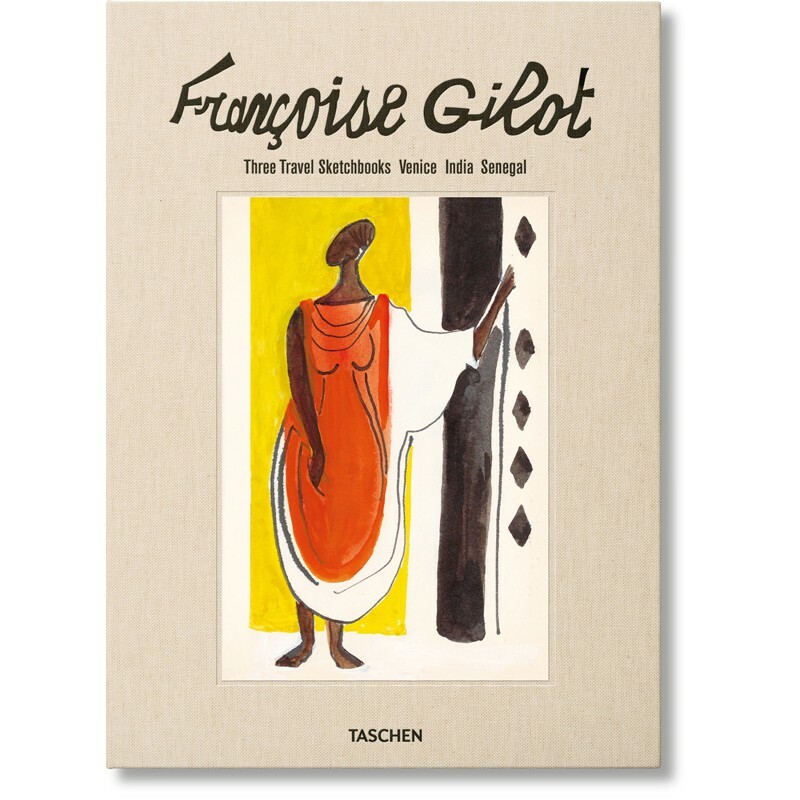 Gilot is impressed by the people she encounters, their movements and meetings, life in the circle huts and on marketplaces. Her sketchbook is almost jewel-like in its colorful intensity, juxtaposed with deep-inked black-and-white line drawings. Again we see many women in flowing garments, their poses like ornaments on the page; we see plants and landscapes, sometimes clear and sometimes as form, moving in and out of abstraction. 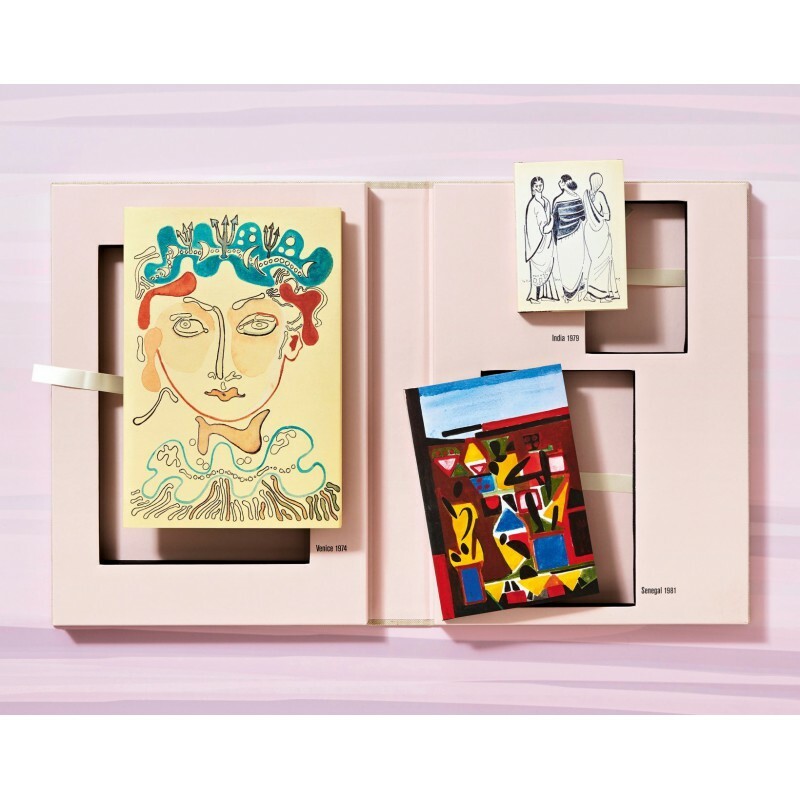 The three sketchbooks are accompanied by an additional booklet containing an introduction by Hans Werner Holzwarth, a conversation between Gilot and Thérèse Crémieux on the artist’s work and travels, and translations of the handwritten text within the drawings. 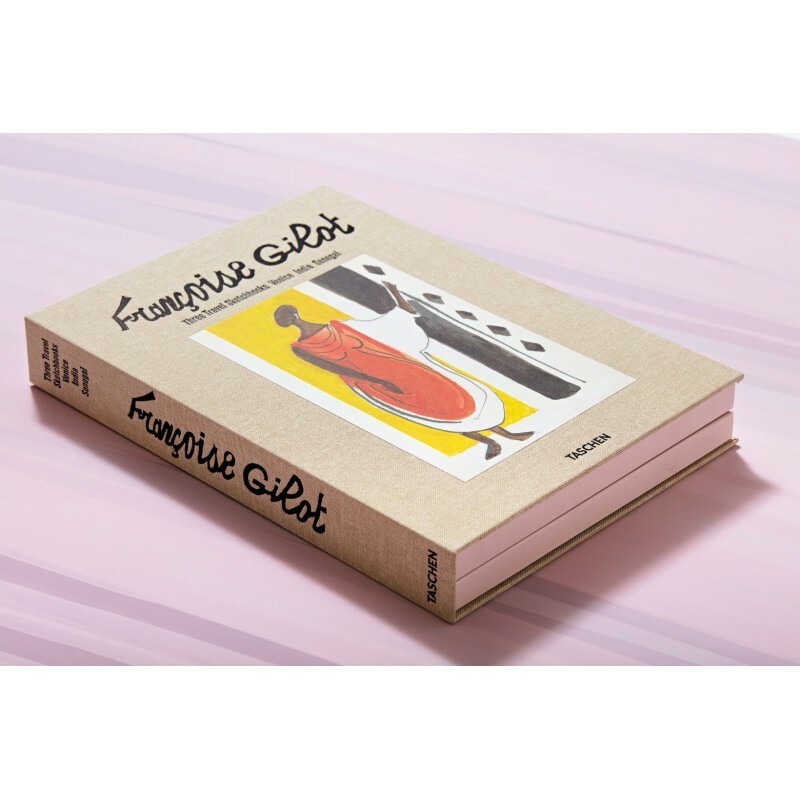 Born in 1921 in Neuilly, France, Françoise Gilot is a painter, printmaker, and writer. She started showing her work in the 1940s as part of the Nouvelle École de Paris movement, and she has since had many international gallery and museum exhibitions and has received awards and honors, including the Ordre des Arts et Lettres, and was made an Officier de la Légion d’Honneur. Her poetry books and memoirs on 20th-century art include the best-selling Life with Picasso (1964) as well as Interface: The Painter and the Mask (1975) and Matisse and Picasso: A Friendship in Art (1990). She lives and works in New York. Thérèse Crémieux is an actress and dramatist who has played in films by Robert Altman, Claude Lelouch, Laurent Heynemann, and Jacques Demy as well as in French theater. She collaborated on her own solo pieces with writer Philippe Ferran and directors Louis-Do de Lencquesaing, John Pepper, and Robert Cantarella. Her first play, Scènes étrangères, was produced at the Comédie-Française, and since 2011 she has written and published a number of plays including L’Art de la séparation, which takes place in Munich in 1933, Superstition, Dernière séance, and Low Cost. Hans Werner Holzwarth is a book designer and editor, with numerous publications mainly on contemporary art and photography. His TASCHEN titles include Jeff Koons, Christopher Wool, Albert Oehlen, Neo Rauch, Ai Weiwei, Darren Almond. Fullmoon, and David Hockney. A Bigger Book.